My fiance and I were impressed with your caricature wedding invitation on portrait workshop and wanted to know if you could provide us with a quote for our wedding invitations. We will be sending out about 50/60 invitations. 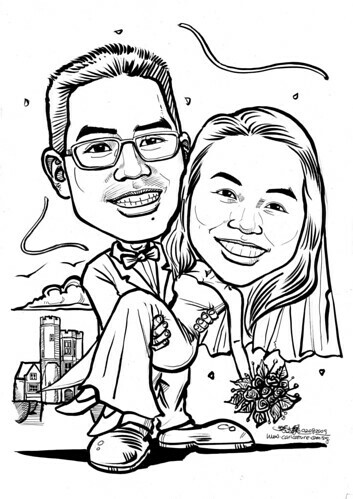 Yun and I would like to proceed with retaining your services to draw a caricature for us. We would like a caricature of me and Yun in front of St Audries Park (the place where we will get married). The image will be used on our wedding invitations. I have attached 2 photographs of me and Yun. If the photographs are not good enough, please let me know and I will email another picture. 4. Please draw Yun carrying me in front of St Audries Park. 5. Please do the drawing in black and white similar to this one - www.flickr.com/photos/caricature/3504860394/ (As mentioned above, we will be using the image for printing on our invitations and would like to try and keep costs down. There is no rush on the image as our wedding is May next year, and we will be sending out the invitations in January 2010. However, I wanted to ensure that we have enough lead time for the images and the printing." Thank goodness this is the former. "Thank you - we love the picture! We are looking forward to receiving the original, getting it framed and hanging it on the wall...but not until after the wedding!